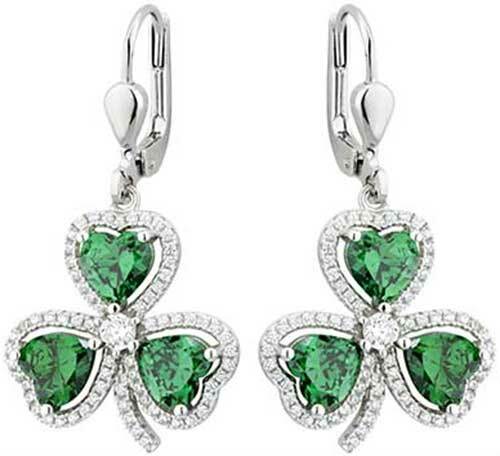 Sterling silver shamrock earrings features green crystals leaves. These sterling silver shamrock earrings feature green crystal leaves along with white crystals surrounding the outline and one larger crystal in the center. The shamrock drop earrings feature a dimensional but hollow design and measures 5/8” wide x 1 1/4“ tall, from the bottom of the stem to the top of the latching Eurowires. 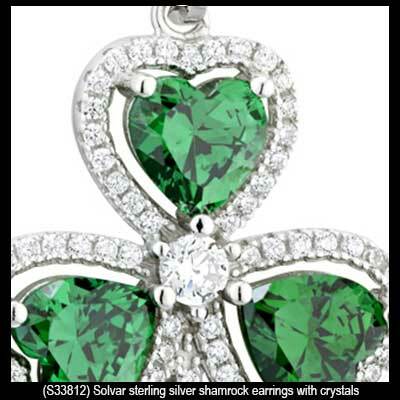 Shamrock pendant is a sterling silver design that features green crystals set in the leaves. 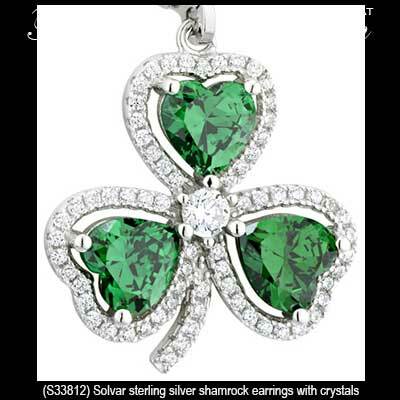 Shamrock necklace is a sterling silver design that features green CZ stone leaves along with a CZ stone studded circle. Shamrock earrings are a sterling silver dangle design that features green CZ stone leaves along with CZ stone studded circles.